Hey guys! Sorry for the late post today. But at least I got it up, right? Lately I've been loving my writing playlists. Writing to music is something that helps me focus and even inspires me. Sometimes a lyric will trigger a conversation between two of my characters. Sometimes the particular sound of a score helps me visualize what a certain place in the story world looks like. 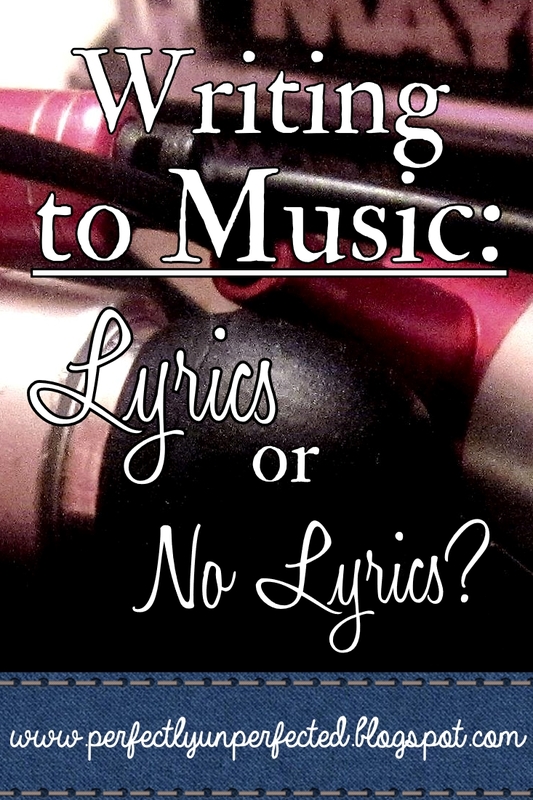 There are many possibilities to what writing to music can do for your writer brain, so today I want to talk about writing to both music with lyrics, and writing to scores. Both have their pros and cons. It's up to you to decide which works best for you! Pro: The words can inspire dialogue, emotions, and the overall feel of a scene. I love writing to music with lyrics when I need a little boost in a conversation between two characters. If my characters are fighting, I'll pick a song with fast-paced lyrics, such as Enemies by Shinedown, Face Down by Red Jumpsuit Apparatus, or even Better Than Revenge by Taylor Swift. If you're going to write to music with lyrics, it's definitely smart to try to match your songs with the scene you're writing. Happy music for happy scenes, sad music for sad scenes, etc. Con: The words can be distracting. This is the biggest reason I don't write to songs that have lyrics. Even right now, my dad has the radio on in his office and I'm struggling to focus on this post because I can hear the words! Sometimes it's easy to follow the words of a song and go off on a daydream or start thinking up a scene that has nothing to do with the one you're writing. Pro: A song with words tells a story. This can be very inspiring and helpful. Heathens by Twenty One Pilots is one song that actually helped me craft a new character and story. Gah, those words! They tell a story all on their own, and that can be so, so helpful to us writers. Just like reading a book helps us write our own books, sometimes listening to the story in a song can have the same affect. In fact, Paradise by Coldplay inspired my book, Unperfected. As soon as I heard these words, my entire story changed. It's amazing what songs can do! Con: That story can stop you from writing your own. Again, this has to do with being distracted. While the stories in songs can be great, sometimes they do more harm than help. Pro: No words means no distractions. Without the vocals, your mind might not wander as easily. When I write to scores, I find it's much easier to focus on the words I'm writing rather than the song. The music becomes background noise; helpful, but not overpowering. Con: Lack of vocals could possibly mean lack of inspiration. While this is not the case for everyone, it is definitely possible that a lack of vocals could hinder you from coming up with ideas. I don't have this problem often, but sometimes a score isn't enough to get my writer brain going. Sometimes I need to hear the story in a song before I can write my own story. Pro: No words allows you to create your own scenes to the song. Without words, a song can be whatever your want! Like I said before, songs with lyrics have stories of their own. But songs without lyrics don't; they just have feeling. You can use those feelings to imagine any scene you want. Con: Scores can remind you too much of their scenes. For example, as I write this I'm listening to scores from Moana. And, as you probable guessed, all I can think about right now is the movie and the scene this score goes with! While I adore writing to scores, sometimes all they do is trigger a movie in my head. I love writing to music. While I usually prefer scores, I love writing to music with words, too. Sometimes I even like to have a playlist that blends the two. And one of my favorite parts about music and technology is that more often than not when you find a great song, you can find the instrumental version of it, too! I'll leave you guys with a short list of my top five favorite songs and scores to write to. Happy writing! I was going to say "No lyrics." 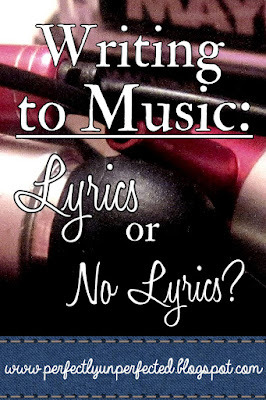 But i was just wriitng a blog post while listening to music with lyrics, so I'm inconsistent. The best way to solve the problem of soundtracks reminding you of the movies is to not watch movies. Okay, that's probably useless advice. But there's other music that has no movies. There's a couple of guys of youtube called Derek & Brandon Fiechter who have some good stuff. Especially for fantasy.